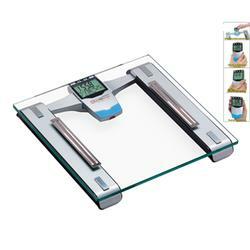 We are pleased to offer our customers Tanita's complete line of body fat scales - always in stock, and always at competitive prices. Tanita InnerScan Body Composition Monitors are the next generation in home healthcare equipment. The exclusive InnerScan concept developed by Tanita offers in-depth insight into your inner health by clearly displaying changes in your overall health and fitness levels. Using Advanced Dual Frequency Technology in-depth information can be provided about muscle mass, central fat level, metabolic rate and physique rating. Visceral Fat Rating - Measure the fat in the abdominal cavity (stomach), surrounding the vital organs. Physique Rating - lets you check your status as you become more active. As you reduce the amount of body fat, your physique rating will also change accordingly. The HBF-516 is an easy-to-use total body monitoring scale which not only calculates visceral fat, but resting metabolism and skeletal muscle mass levels -- both helpful indicators for consumers to use when determining appropriate calorie intake and exercise levels. It also displays standard values such as body fat percentage, weight body age and BMI to help users take proactive steps toward better health. The scale uses full-body sensing technology featuring hand grip and foot electrodes to facilitate a highly accurate reading.